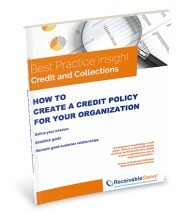 Receivable Savvy Publishes Step-by-Step Guide for the 33% of Companies With No Written Credit Policy | Company Newsroom of Receivable Savvy, Inc.
Atlanta, GA, March 22, 2016	(Newswire.com) - Receivable Savvy today published its free Best Practice Insight: How to Create a Credit Policy for Your Organization, an end-to-end, 25-page guide developed to help organizations create a comprehensive written credit policy. A written credit policy is a key component of any organization hoping to expand sales, gain market share and, most importantly, protect receivables. This guide outlines the process and explains how any organization can create and implement a credit policy to ensure timely payment while simultaneously expanding and maintaining good customer relationships. Identify who should have responsibility in credit evaluation. 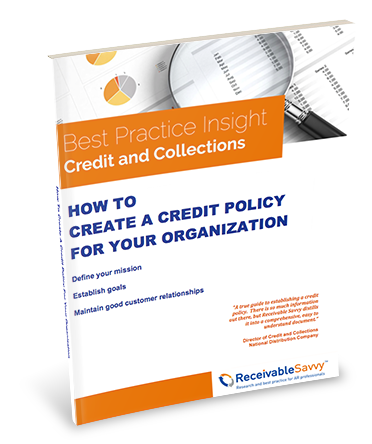 “Our 2015 Perceptions Study indicated that about 1/3 of all respondents do not have a written credit policy,” said Ernie Martin, Founder and Managing Director of Receivable Savvy. “Furthermore, approximately one quarter of organizations with revenue between $100 million and $1 billion have no written policy. This guide is designed to help those organizations understand what a written policy entails, how to implement one and how it can positively influence working capital." How to Create a Credit Policy for Your Organization is the second in a series of free Order-to-Cash Best Practice eBooks Receivable Savvy will publish this year. The first eBook, How to Reduce DSO for Your Organization, was published in February.